Kocheril Raman Narayanan served as the 10th President of India. He was the first Dalit and Malyali President to hold the position ever. Kocherili Raman Narayanan was born on 4th February 1921, but his uncle did not know about his birth date and on the first day of school registered the date of birth as 27th October 1920. Since hen in all office records, his date of birth is the same. The Dalit President has worked for the prestigious institutions named ‘The Hindu’ and ‘Times of India’. K. R. Narayanan was the fourth of seven children of Kocheril Raman Vaidyar. His family belonged to Paravan caste that plucked coconuts. His father practiced Siddha, Ayurveda and Punnaththuraveettil Paappiyamma. Narayanan, accompanied by his uncle, went to school where it was recorded his date of birth as 27th October 1920. All his life, he used this as his official birth-date. He went to Government Lower Primary School, Kurichithanam (5th May 1927), Our Lady of Lourdes Upper Primary School (1931–35), St. John’s High School, Koothattukulam (1935–36). He matriculated from St. Mary’s High School, Kuravilangad (1936–37). He completed intermediate from C. M. S. College, Kottayam (1938–40) aided by a scholarship from the Travancore Royal family. He graduated with B. A. (Honours) and M.A. (English literature) from the University of Travancore (1940–43) with first class. Narayanan worked as a journalist with ‘The Hindu’ and ‘The Times of India’, Delhi (1944–45). In 1945, he went to England and studied political science under Harold Laski at the London School of Economics. K. R. Narayanan earned honours degree of B. Sc. (Economics) with specialisation in political science. He was financially supported by J. R. D. Tata. As a diplomat in Rangoon, Burma, Narayanan met Ma Tint Tint who married him on 8th June 1951 in Delhi. As per Indian law, Nehru had to give permission for the marriage. Ma Tint Tint changed her name to Usha and became an Indian citizen. She got her Masters in Social Work from Delhi School of Social Work. The couple have two daughters, Chitra Narayanan (Indian ambassador to Switzerland) and Amrita. Academics: Narayanan taught Economics at the Delhi School of Economics (1954). He served as the Vice-Chancellor of Jawaharlal Nehru University (JNU) in New Delhi (3rd January 1979 – 14th October 1980). Political: After returning from London, Narayanan met the Indian Prime Minister, Jawaharlal Nehru at the Parliament House. He had given a letter from Professor Laski from London School of Economics. In 1949, he started working as the Indian diplomat in various embassies. These included: Rangoon, Tokyo, London, Canberra, Hanoi, Thailand (1967–69), Turkey (1973–75), and the People’s Republic of China (1976–78). Later, during Indira Gandhi’s administration, he was the Indian Ambassador to the United States (1980–84). On request of Indira Gandhi, Narayanan entered politics. He won three successive general elections to the Lok Sabha in 1984, 1989 and 1991. Narayanan was a Minister of State in the Union cabinet under Rajiv Gandhi, when he held portfolios of Planning (1985), External Affairs (1985–86), and Science and Technology (1986–89). During his work at the Parliament, he resisted international pressure to tighten patent controls in India. 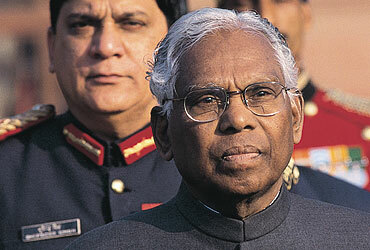 K. R. Narayanan was elected as the Vice-President of India on 21st August 1992. He later was the President of India. He was sworn in as the President of India on 25th July 1997 by Chief Justice J. S. Verma in the Central Hall of Parliament. President K. R. Narayanan praised the democratic system of Indian government and politics during his midnight address (14th August 1999). President K. R. Narayanan addressed to the nation on the golden jubilee of the Indian Republic (26th January 2000). He emphasized on the economic justice to the Indian people. He constantly stressed on providing education to all for the improvement of the country. Narayanan’s family lived in a central Delhi bungalow on 34 Prithviraj Road. Narayanan and Usha attended alternative globalisation movements of World Social Forum, Mumbai (21st January 2004). Narayanan addressed and concluded at the forum session. K. R. Narayanan died at the Army Research and Referral Hospital, New Delhi, due to pneumonia and renal failure. The following evening, at sunset, he was cremated with full state honours in Karma Bhumi near Rajghat, New Delhi. The Samadhi is visited by all especially on his death anniversary. Kocheril Raman Narayanan always strived to do good to the society especially the Dalits and tribal caste. He wanted India’s economic growth to be Uniform. He wanted India to be among the most literate nations. K. R. Narayanan visioned for a better India with every people having basic education. He wished for social equality for dalits as well as females of the country. Untouchability is not prevailing in laws now but India still deprive the untouchables and does not give their right which needed to be eradicated according to the 10th President of India.